This time of year is getting a little hectic with end-of-the-school-year activities colliding with new summer interests. Our children are wrapping up dance, while starting up soccer, and finishing craft club, while beginning softball. But no matter what time of year it is, we have a pre-game, pre-performance ritual to get ourselves psyched! A few years ago, my husband introduced a heaping spoon of peanut butter. Gratefully none of us are allergic and we all love it (plus it has some nutritional value), and we were easily convinced that a scoop of peanut butter would set us off on the right foot. Some of our activities are beginning early these days, and my children are expected to be up and filled with energy right after breakfast. I decided to take our ritual of mounds of peanut butter and transition it into a morning smoothie. 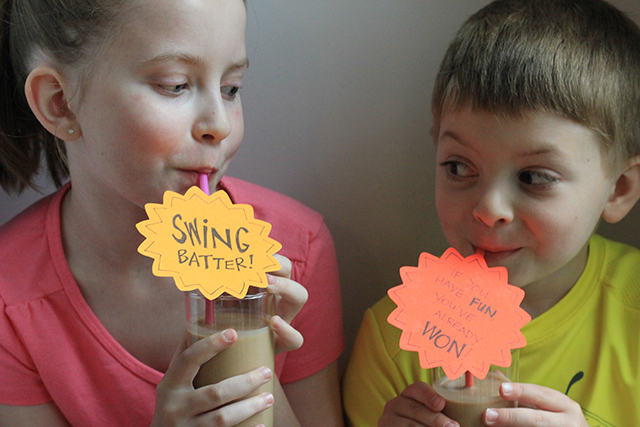 My children love fruit smoothies and chocolate milk so it wasn't a far leap! To add a little extra loving, I decided to make some straw notes to wish my favorite athletes all the best. It was a cute surprise to greet them at the breakfast table. M is our slugger in her second year of softball, and C is a big kicker in her second year of soccer. I used flexible straws and attached our notes with some tape on the back. Be sure to tape right above the bend so that your straw can both reach into the glass and the note is low enough to make the straw functional. Little L is not yet in organized sports or activities, but that didn't stop him from wanting a smoothie to start off his day! I picked up the Carnation Breakfast Essentials at Walmart. For a limited time while supplies last, they have a coupon available for your own smoothie making. And if you're looking for more smoothie recipes, check out Carnation's host of ideas or follow them on Facebook. And parents, of course, need a little extra success, too, so pour yourself a glass of these delicious creations. Do you have any pre-game rituals that get your kids off on the right foot?